Pythagorean Theorem is also known as ‘Pythagoras theorem’ and is related to the sides of a right angled triangle. In a right triangle the area of the square on the hypotenuse is equal to the sum of the areas of the squares of its remaining two sides. 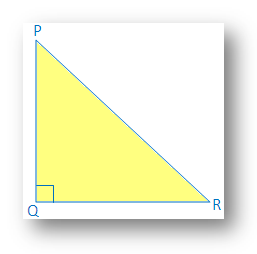 In the adjoining figure, ∆ PQR is a right angled triangle where QR is its hypotenuse and PR > PQ. Square on QR is QRBA, square on PQ is PQST and the square on PR is PRUV. The point of intersection of the diagonal of the square PRUV is O. The straight line through the point O parallel to the QR intersects PV and RU at the point J and K respectively. Again the straight line through the point O perpendicular to JK intersects PR and VU at the point L and respectively. 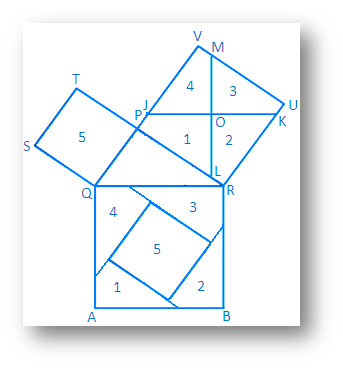 As a result, the square PRUV is divided into four parts which is marked as 1, 2, 3, 4 and the square PQST is marked 5. You can draw the same figure on a thick paper and cut it accordingly and now cut out the squares respectively from this figure. Cut the squares PRUV along JK and LM dividing it in four parts. Now, place the parts 1, 2, 3, 4and 5 properly on the square QRBA. (ii) Square drawn on side PQ, which means the area of a square of side PQ is denoted by PQ2. Identify the sides and the hypotenuse of the right angle triangle. The one sides length = 8 m and the other side length = 15. 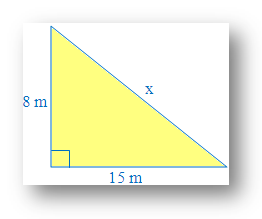 'X' is the length of hypotenuse because it is opposite side of the right angle. 2. 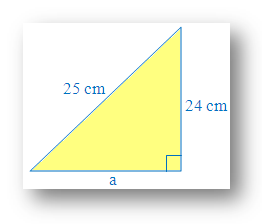 Use the formula of Pythagorean theorem to determine the length of ‘a’. 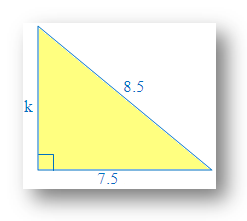 Identify the perpendicular, base and the hypotenuse of the right angle triangle. Length of perpendicular = 24 cm and the length of base = a. Length of hypotenuse = 25 cm. Since hypotenuse is the opposite side of the right angle. Hypotenuse = 8.5, since hypotenuse is the opposite side of the right angle.